What system works best for rotating frozen food? How do you remember to use your system? A major challenge for home cooks applies to the pantry, refrigerator and the freezer: Rotation. How do you make sure that items don’t get pushed to the back and out of sight? The freezer is the hardest because we don’t open it as often, the food is safe for the long term, and no one likes to stand in front of an open freezer. But before we realize it, the freezer gets filled up with little bits of this and that—things we could have used. Using the freezer effectively means defrosting food in advance. 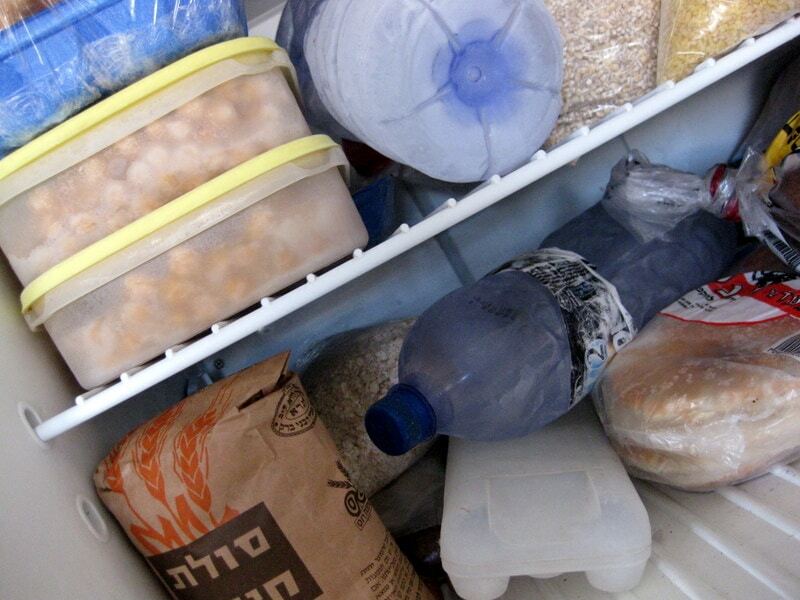 There are two basic methods of using your freezer to get a head start on home-cooked meals. Using a combination of these two methods works well too. Freezing components of meals. That is the method I usually prefer. The advantage is that the actual cooking is done on the spot, so the food tastes fresher. It’s also easier to adjust quantities. Here’s a list of cooked Foods for Putting Quick Meals Together. You can also marinate fresh meat or chicken, then freeze it. Put it in the refrigerator the night before you plan to cook it. Freezing complete meals. This is best for people who need to heat up food in a few minutes, say right after work, or home cooks who are not always home to serve meals. It also requires several hours or more to plan and prepare so many meals. Or you can double or triple recipes as you go. On Sunday I’ll share ideas for keeping track of your freezer contents and rotating them effectively. I also prefer to freeze components of meals. I usually buy fresh chicken and beef, and cut and clean it before freezing. I also keep chopped onions and garlic in the freezer. The preparation takes some time, but I only have to do that once or twice a month, and all subsequent meals are faster and easier to put together. I find it’s a more efficient use of my freezer than freezing prepared meals (which often aren’t as good when re-heated). It sounds like you have a good system, Debbie. You know, here I was thinking that I’m not much of a make-ahead-and-freeze person, but I wasn’t counting freezing components, a major part of my cooking strategy! I never thought to chop onions and garlic ahead though, what a good idea. Hannah, I would be interested to know what marinades you recommend for chicken. Bookish Ima, you’re more organized than you think! We basically have one, lemon, chopped garlic and (sometimes) herbs. We don’t like anything sweet and why add salt? I usually (but not always) make twice or three times the amount of food I need. What doesn’t get used goes straight into the freezer. I’ve got a freezer full of cooked briskets, roasted chickens, kugels, challahs and even profiteroles. It’s always easy to prepare meals in our house, because at least half of them are already cooked and just a defrost away.